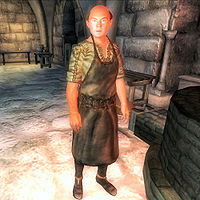 Hans Black-Nail is a Nord warrior employed as a smith in Castle Bravil. He is also a Mythic Dawn sleeper agent, and will attack you on sight upon completion of the Dagon Shrine quest. Hans' room is located in the southern part of the Private Quarters East Wing and he sleeps there every night until 6am, when he gets up and starts wandering around near his forge. At 8am, he exits the castle and heads for the Great Chapel of Mara, where he will pray at the altar of Arkay or sit on a pew for two hours. He moves on, and even though he is not a member himself, he will pay a visit to the local Fighters Guild hall, where he will spend yet another two hours watching Vincent Galien and Tadrose Helas doing their sparring session. He returns to the castle at midday, reenters the East Wing, and strolls around near the forge until dinnertime at 7pm, which he will take in the castle's barracks. At 10pm, he returns to the East Wing where he will stay until his bedtime at midnight. His choice of clothing is typical for a man in his business, a blacksmith's apron and pants along with a pair of rough leather shoes. He also carries the key to the castle and a small amount of gold. In combat he will summon the Mythic Dawn armor and mace. His room in the castle doesn't hold anything noteworthy, except for two copies of Mythic Dawn Commentaries 1, a Conjuration skill book and common reading among Mythic Dawn agents. In his introduction, he will give you a hint as to why he spends time in the Fighters Guild hall: "Hans Black-Nail, Castle Smith. It's a comfortable post. Gives me plenty of time to offer services to the public." If you ask him about Bravil, he will give you a bit of insight on his life-long relationship with Count Regulus Terentius: "I was with the Count when he was young, and a shining star on the tournament path. I only wish he'd straighten his son out." Oddly, while at the Chapel, Hans will stand next to the altar of Arkay, but will actually receive the blessings from the altar of Talos from the opposite side of the room. Esta página foi modificada pela última vez à(s) 05h29min de 20 de outubro de 2015.